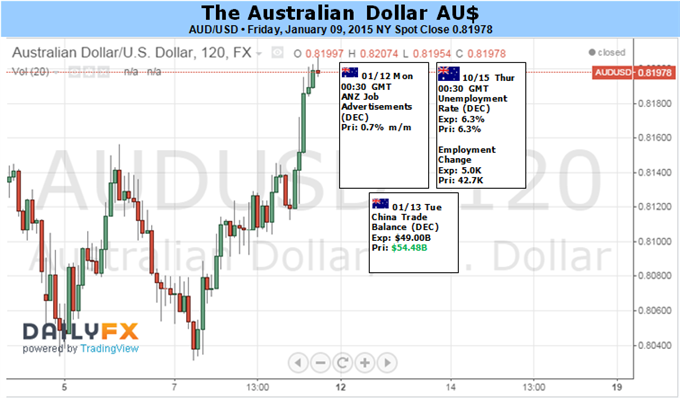 The AUD/USD is trading at 0.8142 up by 19 points as the US dollar eases. 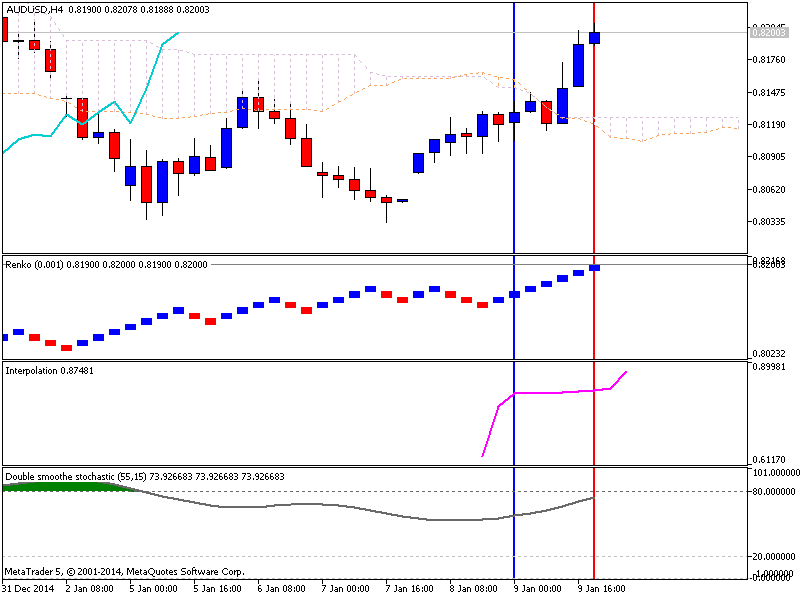 The currency should have fallen when retail sales printed below expectations but it saw little reaction. The Aussie jumped above the 0.8100 level on Thursday following the release of surprisingly strong figures showing approvals for the construction of new homes had risen 7.5 per cent in November. The currency was also being supported by lower oil prices while concerns over the Eurozone were driving investors towards the Aussie dollar. The euro was in rapid decline as investors seeking better returns favored the Aussie and kiwi currencies. Commodity currencies are beginning gain momentum as traders look for safe places to invest with the JPY worrisome at present. This morning data showed a significant drop in China’s PPI index while CPI met expectations. Slowing consumer demand has been hurting Chinese companies already suffering from thinning margins, and it looks like the pain isn’t ending any time soon. These numbers are key for tracking a potential global demand slow down, and economists are especially worried about that since deflation has taken hold in Europe officially. In China, economists like Societe Generale’s Wei Yao are especially watching PPI. PPI tells us how much money producers are getting for their goods. Inflation data in the UK and the US, US retail sales, PPI and employment data, Philly Fed Manufacturing Index and Consumer sentiment are the main events on Forex calendar. Here is an outlook on the highlights of this week. Last week, NFP report was better than expected showing a job gain of 252K in December. The solid increase indicates further strengthening in the US economy. The Unemployment rate fell 0.2% to a 6-1/2 year low of 5.6%, beating forecasts for a 5.7% reading. However, average hourly earnings which showed a 6 cents increase in November, dipped 5 cents in December. Long-term unemployed continued to shrink in December, but the labor force participation rate fell to 62.7% from 62.9% in November. Will wage growth in the US labor market continue improve in the coming months? UK inflation data: Tuesday, 9:30. UK consumer prices plunged to a twelve year low of 1% in November, reaching half the BoE’s inflation target. The reading was worse than expected caused by a sharp and continuous decline in oil prices. However the low oil prices were positive for consumers, boosting spending and supporting UK growth. The Bank’s monetary policy committee said in its November inflation is likely to fall below 1% in early 2015. UK consumer prices are expected to increase by 0.7%. US retail sales: Wednesday, 13:30. U.S. consumer spending edged up in November amid the holiday shopping season, boosted further by lower gasoline prices. Meanwhile, retail sales excluding automobiles, gasoline, building materials and food services rose 0.6% after an unrevised 0.5% gain in October. Economists expected core sales to rise a mere 0.1% last month. The shopping spree accelerated growth in the fourth quarter. Retail sales are expected to gain 0.2%, while Core sales are predicted to increase by 0.1%. Australian employment data: Thursday, 0:30. Australia’s unemployment edged up to 6.3% in November as more people looked for jobs. Economic activity weakened by sluggish Chinese demand. However the Australian job market added 42,700 positions in November, much better than the 13,700 increase posted in the prior month and the 15,000 addition forecasted by analysts. This rise suggests improvement in the Australian labor market. Policymakers are preparing for further easing measures in case the weakness in the job market and domestic demand continues. Economists expect job growth to increase by 5,300 while the Unemployment rate is expected to remain unchanged at 6.3%. US PPI: Thursday, 13:30. Producer Price Index fell 0.2% in November prompted by lower oil prices, following a 0.2% gain in the prior month. Analysts expected a smaller decline of 0.1%. On an unadjusted basis, producer prices increased 1.4% for the 12 months ended November, the slowest 12-month increase since February 2014. Core producer prices, excluding food and energy remained unchanged after a 0.4% rise in November. Producer Price Index is expected to drop 0.3% this time. US Unemployment claims: Thursday, 13:30. The number initial claims for unemployment benefits declined last week by 4,000 to 294,000 amid a sharp decrease in dismissals. Strong consumer spending had a positive effect on the labor market, despite a weakening in global economy. The four-week moving average a more solid measure of labor market trends, remained below the 300,000 mark for the 17th straight week. Jobless claims is expected to reach 299,000 this week. US Philly Fed Manufacturing Index: Thursday, 15:00. Factory activity in the U.S. mid-Atlantic region plunged to 24.5 in December from 40.8 in the previous month, indicating slower activity. New orders fell to 15.7 from 35.7. Employment conditions weakened to 7.2, down from 22.4 marking the lowest level since April. Philly Fed Manufacturing Index is predicted to reach 20.3 this time. US Inflation data: Friday, 13:30. U.S. consumer prices registered their biggest decline in nearly six years in November amid a slide in gasoline prices. Consumer Price Index plunged 0.3%, following flat reading in October. On a yearly base CPI increased 1.3% the smallest gain in nine months, after posting a 1.7% rise in October. While inflation declines, the US job market continues to strengthen including a big gain in weekly earnings. Meanwhile, Core CPI excluding food and energy prices gained 0.1% following a 0.2% rise in the previous month. The rise suggests oil prices are the main cause for the sharp declines. Analysts expect consumer prices to dip 0.3% while Core prices are expected to increase 0.1%. US Prelim UoM Consumer Sentiment: Friday, 14:55. U.S. consumer sentiment surged in December to a near eight-year high amid improved earnings and better job prospects. Consumer sentiment edged up to 93.8 from 88.8 in November. The survey’s one-year inflation expectation rose to 2.9 percent from 2.8 percent, while its five-year inflation outlook also rose to 2.9 percent from 2.6 percent last month. Economists expect consumer sentiment to rise further to 94.2 this time. 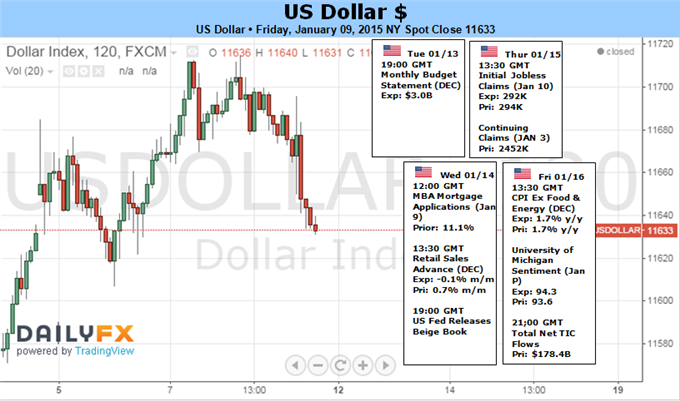 US Dollar Run As Robust - or Fragile - as S&P 500? The Dollar has advanced for four successive weeks and is working on a record-breaking seventh consecutive month of gains. Few other market benchmarks enjoy this degree of consistency – and that is equally inspiring and unnerving for traders. Though its life span is unmatchable, there are many parallels to be drawn between the S&P 500’s epic climb and the US currency’s own advance. With the economy holding a strong course while much of the world stagnates, both currency and capital market enjoy the spoils. Yet, the ideal balance necessary to maintain this positive correlation is unlikely to last. So, are both at-risk of a collapse or will the fundamental burden of one leverage the other? Historically speaking, the Dollar and S&P 500 do not move in concert. Over the past decade, the two have fostered a negative correlation. That is due to the nature of equities as a speculative asset class favored for higher returns while the Dollar is treated internationally as a safe haven reserve. Their value shows is leveraged under different market conditions. Currently, the 60-day (three-month) rolling correlation between the two is 0.73 – strongly positive. Why is that? We are in a transitional period where market participants are still reaching for yield– despite growing risks – while financial conditions are tightening with heavy speculation of a return to rate hikes for the Fed. The prospects that the Federal Reserve will lift the US benchmark lending rate in the foreseeable future while many of its counterparts are either neutral or persuing stimulus is a tremendous appeal for the Dollar. Speculation surrounding the timing of the first move was teased this past week between jobs data and FOMC updates. Neither would provide a clear view. The minutes from the December meeting remarked that a hike before April was unlikely before April, but it also stated that rates could rise even if core inflation remained at current levels. Meanwhile, the jobless rate dropped to its lowest level since June 2008 though wage growth (an important inflation factor) posted its biggest drop in on record. Net, both events are net hawkish. Conditions are generally improving to the point where rate hikes will become likely. yet, there is still ambiguity in the timing of that turn to tightening – whether the “mid-2015” vow means June/July or Fed Funds futures are correct in pricing in the fourth quarter. In that uncertainty, the Dollar is bid because its yield is on track to still rise before most counterparts while speculators seeking return can ignore the rising cost of their exposure for a little time longer. Yet, as we close in on the expected range, one side will likely crumple. In the event the time frame is moved out, the Dollar may still hold a hawkish advantage over many; but it will see its untapped premium dry up and gains more difficult to generate – if they can be sustained at all. Alternatively, a more timely return to a tightening regime will only magnify the Greenback’s bullish contrast and likely leverage a capital market rebalance (risk aversion). Neither of these themes is beholden to a particular indicator or event as last week shows us. But, the passage of time will ratchet up the tension to unsustainable levels as the lift off date draws closer. This week, there are a few cues to watch for rate speculation with the December CPI reading as the top billing. However, it is ‘risk’ that is the unknown quantity. Volatility is rising, various markets are already correcting and the foundation is built on leverage and excessive risk taking. A spark doesn’t need to be large. 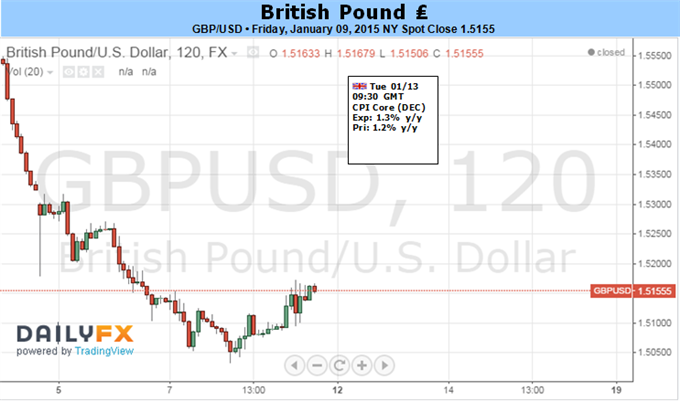 GBP/USD may struggle to hold above the 1.5000 handle in the week ahead should the fundamental developments coming out of the U.K. economy curb the Bank of England’s (BoE) scope to normalize monetary policy in 2015. A marked slowdown in the U.K. Consumer Price Index (CPI) may further dampen the appeal of the British Pound and drag on interest rate expectations as the headline reading is projected to highlight the slowest pace of growth since 2002. However, market participants may show a greater reaction to the stickiness in the core rate of inflation as the BoE sees transitory effects driving the CPI below 1%, and the British Pound may face a near-term rebound should central bank Governor Mark Carney continue to prepare U.K. households and businesses for higher borrowing-costs. With the BoE scheduled to testify on the Financial Stability report next week, we may see Mark Carney and Co. retain an upbeat tone for the region as the committee sees lower energy costs boosting private-sector consumption. As a result, the BoE may adopt a more hawkish tone for monetary policy as it anticipates a stronger recover in 2015. In turn, the fresh batch of central bank rhetoric may limit the downside risk for GBP/USD and produce a more meaningful rebound in the exchange rate especially as the Relative Strength Index (RSI) comes off of oversold territory. The RSI signal paired with the monthly/yearly opening range suggests that a major low could now be in place, but the long-term outlook for GBP/USD remains bearish as the Fed is widely expected to normalize monetary policy ahead of the BoE. 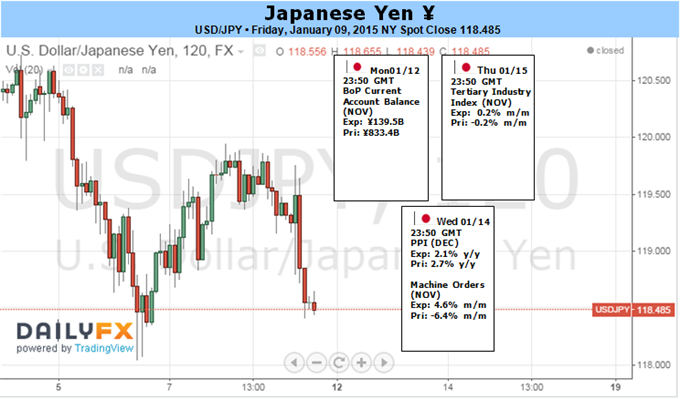 Japanese Yen Reversal Risk Grows - Will History Repeat itself? The Japanese Yen snapped a multi-week losing streak for the US Dollar as it rallied noticeably off of recent lows. A slowdown in global economic event risk may produce smaller moves ahead, but we’re watching key levels on the USDJPY as the risk of a larger JPY correction grows. Traders sent the Japanese currency near fresh multi-year lows into the final trading days of 2014, but an important bounce in the New Year suggests conviction in the JPY-short trade (USDJPY-long) has faded. Price action seems remarkably similar to what happened exactly 12 months ago: the USDJPY topped on the first trading day of 2014 on its way to a four percent correction. A comparable move would send the Dollar to ¥115 before a resumption in the overall uptrend. A relatively quiet week in both Japan and the US nonetheless suggests traders may wait until the following week’s highly-anticipated Bank of Japan policy meeting to force big Yen moves. Yet traders should keep a close eye on USDJPY price action as it trades at potentially significant price support, and a break below month-to-date lows near ¥118 could force a larger move towards December’s trough at ¥115.60. A strong correlation between the Japanese Yen and the Nikkei 225/US S&P 500 tells us the next big USDJPY move could coincide with equity market turmoil. An important drop in the S&P Volatility Index (VIX) shows that few fear any such tumbles, but market conditions can and do change quite quickly. Overall outlook for the Dollar and Japanese Yen in 2015 make a USDJPY-long position one of our favorite trades of the year. Yet a year is a long stretch of time in trading markets, and prices do not move in straight lines. We are cautious on fresh USDJPY-long positions given clear risk of a larger short-term correction—particularly ahead of the Bank of Japan meeting on January 20. The Australian Dollar will have to balance competing forces in the week ahead, with a dose of potent home-grown economic data vying for influence alongside macro-level crosscurrents. On balance, the currency seems likely to continue to recover having started the year at the lowest in over five years against its US counterpart. Domestically, the spotlight will be on December’s Employment report. Expectations suggest the economy added 5,000 jobs last month, amounting to the weakest reading in three months. Australian economic news-flow has notably improved relative to consensus forecasts over the past four weeks however, suggesting economists are underestimating the economy’s momentum and opening the door for an upside surprise. Such an outcome may pour cold water on building RBA interest rate cut speculation. Indeed, a gauge of the implied outlook reflected in OIS pricing points to at least one 25bps reduction in the baseline lending rate over the next 12 months and has been creeping closer toward calling for two over recent weeks. 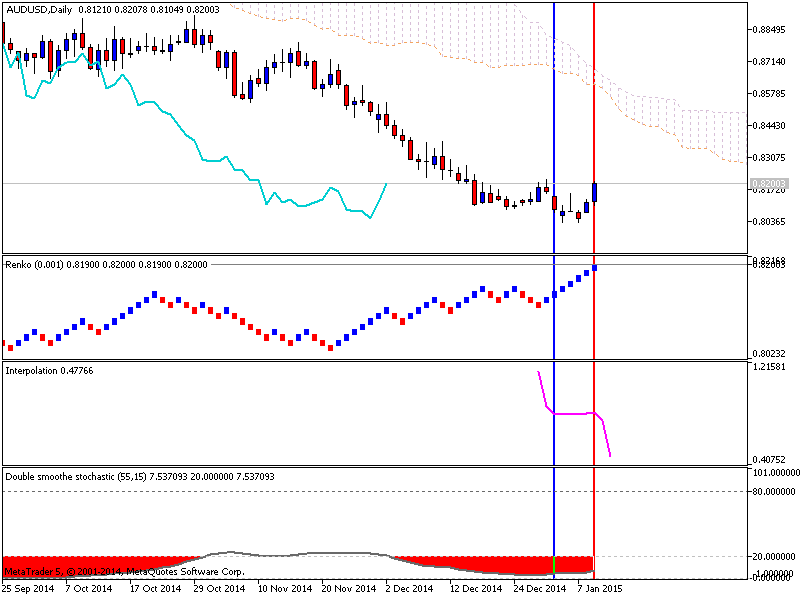 A jobs report that pushes back against this dynamic is likely to offer support to the Australian Dollar. On the external front, US data will be in focus. The response to December’s payrolls data suggests that – with only a handful of exceptions – FX markets are splintering away from broader sentiment trends. The parallel declines in the S&P 500 and the US Dollar apparently triggered by soft wage growth readings hint the former is concerned with global growth trends while the latter is focused specifically on the Fed policy outlook. US retail sales, inflation and consumer confidence figures as well as the Fed’s Beige Book survey of regional economic conditions are all due to cross the wires in the coming days. The growth side of the equation looks mixed considering the Fed’s assessment is likely to take a balanced view and sentiment is seen firming while retail activity is expected to slow. Though this casts a cloud of uncertainty over sentiment trends, the FX picture looks clearer as soft price growth undercuts Fed rate hike bets, sending AUDUSD higher. Gold prices snapped a three-week losing streak this week with the precious metal rallying 2.51% to trade at $1218 ahead of the New York close on Friday. The rally comes amid massive swings in broader risk sentiment and ongoing political uncertainty in Europe saw markets plummet early in the week before staging a strong ‘V’ recovery to pare nearly the entire decline. Stronger-than-expected US Non-Farm Payroll (NFP) numbers on Friday offered little support for the greenback. which had pushed into highs not seen since 2009. The headline print topped expectations with a read of 252K, with the unemployment rate slipping to an annualized 5.6% from 5.8% the month prior. Yet a deeper look into the report showed the labor force participation rate unexpectedly falling from 62.9% to 62.7%- last year’s low and a level not seen previously since the late-1970s. The data suggests that the recent contraction in the labor force may have added artificial downside pressure on the headline unemployment rate, while wage growth remains stagnant with Average Hourly Earnings marking the slowest pace of growth since 2012. Today’s data comes on the back of the FOMC Minutes from the December 17 policy meeting which showed a much more tempered interest rate expectation with regards to both the timing and scope of Fed rate hikes. The US Dollar traded heavy into the close of the trade as profit taking alongside a more cautious read of today’s report. Looking ahead to next week, traders will be eying retail sales data, the Consumer Price Index (CPI) and the University of Michigan confidence surveys. The headline reading for inflation will be central focus as the Federal Reserve struggles to achieve price stability, and a weaker print here could offer further support for bullion prices at the expense of the greenback. From a technical standpoint, gold continued to trade within the confines of a well-defined Andrew’s pitchfork off the March high with Friday’s advance challenging the upper median-line parallel. Interim support rests at $1206 (2013 low-day close) and is backed by the lower median-line parallel of a near-term pitchfork off the November lows, currently around $1171/80. We’ll reserve this region as our bullish invalidation level with the medium-term outlook weighted to the topside while above $1171. 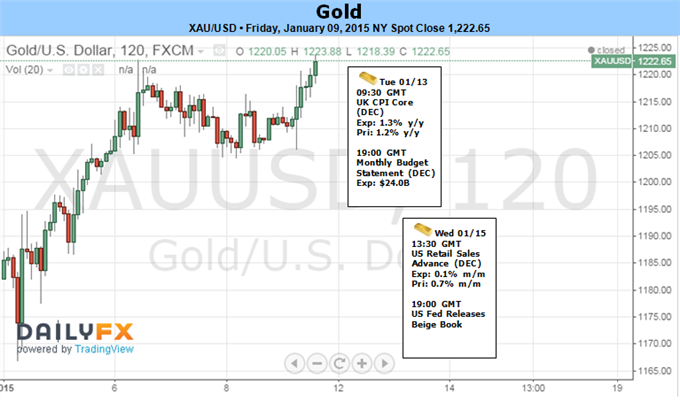 A breach above resistance targets objectives at $1230 and critical resistance at $1236/37. This region is defined by the 2013 low-week close, the 50% retracement of the July decline and November median-line parallel. Look for weakness early next week to open up a push higher in gold with only a break below $1171/80 putting the broader down trend back in focus.